Battling for a top-three position throughout a challenging week of enduro competition in Chile, Outsiders Yamaha Official Enduro Team rider Loïc Larrieu has secured a solid fifth place result in the Enduro 2 category at the 2018 International Six Days Enduro. Further strengthening Yamaha’s presence at this 93rd running of the event, Jessica Gardiner helped Team Australia win the Women’s World Trophy for an impressive sixth consecutive time. 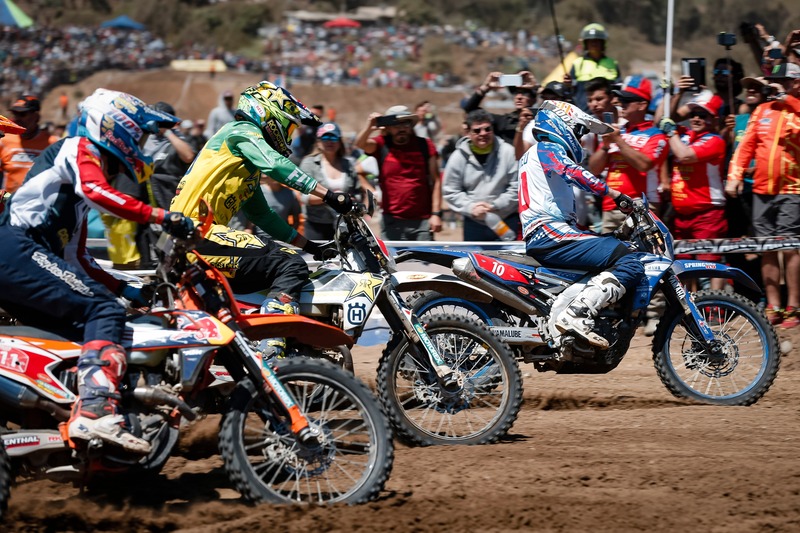 Featuring six days of racing in extremely hot, dusty and slippery conditions, this year’s ISDE proved to be notably demanding for all competitors. Claiming the overall individual victory at the 2017 ISDE in France, Loïc Larrieu entered this year’s event looking for a strong performance in Vina del Mar. Enjoying a positive start to the week-long event, Larrieu found himself second in the Enduro 2 category and less than one-minute behind the provisional class leader at the end of day one. Continuing to battle for a provisional top-three class result throughout the week, the Frenchman was left with a mountain to climb following a big crash early on day five. Returning stronger for the sixth and final day of the 2018 ISDE, the WR450F powered rider posted the fastest time of all Enduro 2 class riders during the final cross test. Placing an eventual fifth overall in the Enduro 2 category, Larrieu helped Team France secure fourth in the final World Trophy classification. WR250F powered Jessica Gardiner helped Team Australia make history by topping the Women’s Trophy classification for the sixth time. Remaining consistent throughout the week in Chile, the young Aussie also claimed a strong fourth place result in the Enduro Women category. Representing Team Spain, WR250F powered Victor Guerrero secured a podium result by placing third in the Enduro 1 category. Together with his brother Cristobal Guerrero, the two Yamaha powered riders helped Team Spain secure a fifth place result in the World Trophy standings. The 2018 ISDE brings the Outsiders Yamaha Official Enduro Team’s highly successful involvement with international enduro competition to a close. Officially representing Yamaha at the pinnacle of global enduro competition for the last three years, the French-based team have enjoyed a wealth of success since 2016. With Loïc Larrieu finishing as the Enduro 2 World Championship runner-up in 2016 and 2018, and the EnduroGP World Championship runner-up in 2017, the WR450F powered rider also claimed the outright victory at the 2017 ISDE. In the 250cc category, Outsiders Yamaha Official Enduro Team rider Jamie McCanney has finished as the Enduro 2 World Championship runner-up in 2017 and the Enduro 1 World Championship runner-up in 2018. The Outsiders Yamaha Official Enduro Team will no longer participate in the FIM Enduro World Championship. Complete details on the team’s plans for the future will be announced in the coming weeks.